Lilicious is a beautiful girly wordpress theme. It’s pretty clean and simple 2 column wp skin with sidebar possitioned on the right side and filled with standard wordpress menus. Main content area is white and located on the right side. There is a little red date square next to each post. Search function is located just below header and has a magnifying glass icon. 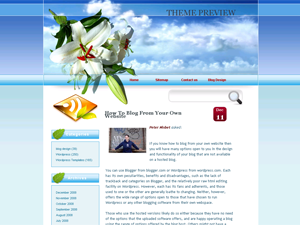 The header graphic is what makes this wordpress skin special because it’s just beautiful – white lilies on the left side and blue skies with scattered white coulds in the background. Lilicious wordpress template was designed by Lorelei.